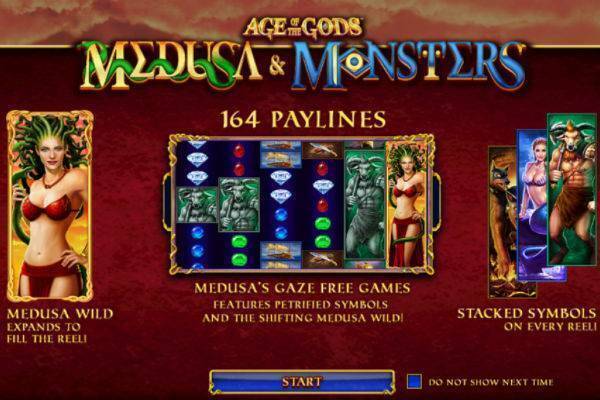 Age of the Gods: Medusa and Monsters is a Playtech 6-reel, 164-ways-to-win progressive video slot. Released in 2018, this game takes you on a dangerous sea voyage, confronting mythical monsters aiming to separate you from your money! Greek legend tells us that Medusa is a snake-haired lady whose mere stare turns those who look at her into stone. The tone of this title, the eighth in the Age of Gods jackpot series, is a lot darker and scarier than its predecessors. 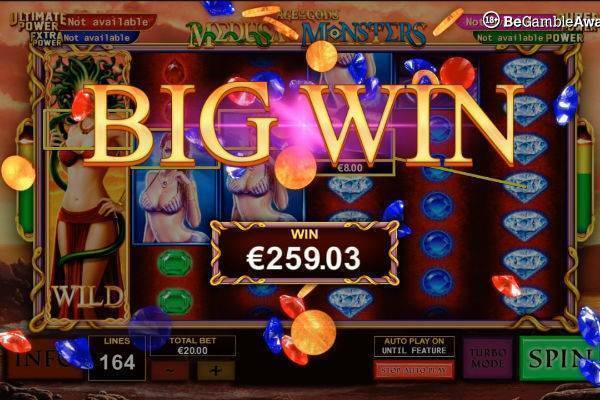 Once you acclimate to the terrifying tone and the almost overwhelming number of ways to win, you can concentrate on bagging some serious bank, enjoying the bonus features and free spins, and taking a shot at the big jackpots that are a hallmark of this series. Return to Player is an impressive 96.09%. Set sail at a suggested casino! Coin value starts at a mere penny and ranges up to £25. There are 20 paylines, all active, so the minimum bet is £0.50 and the maximum £500. Turbo mode speeds up the action, and a selection of autoplay options let you just lean back and watch the action. The 6-7-6-7-6-7 layout and stacked symbols may take some getting used to, but you’ll get the hang of it after a while. The Wild symbol is the leading lady, Medusa, and is capable of expanding on any reel. You are randomly given a shot at winning the Age of the Gods progressive jackpot, even if you didn’t have a winning spin in the base game. Betting more will improve your odds of reaching this “power” jackpot round. You need to choose from 5×4 grid, each of the 20 symbols hiding symbols of one of the four jackpots: Power, Extra Power, Super Power and Ultimate Power. Uncover three symbols of the same jackpot and you win it. The first three jackpots will not change your life, but maybe put you behind the wheel of a sailboat. The Ultimate power prize, on the other hands, sets sail at about £80,000 and usually grows well into hundreds of thousands of pounds, sometimes nearing the princely sum of one million sterling. On average, it pays out each 6 weeks or so. 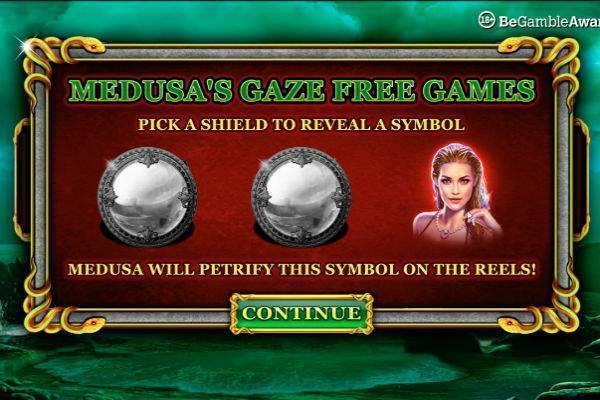 Medusa’s Gaze Free Games: 3 scatters showing fully or partially on the 2nd, 4th, and 6th reels will trigger 5 free spins, sending you off to a screen showing a trio of shields. Pick one to uncover one of the high value symbols (either the Siren, Cerberus or the Minotaur). This becomes sticky for the free spins, substituting as well for the other two symbols you didn’t pick. 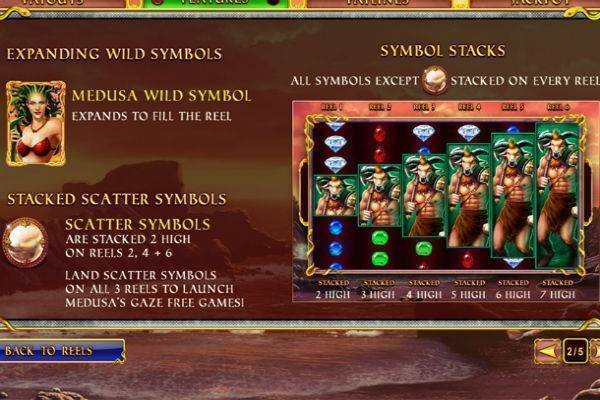 Though there are no wilds during free spins, Medusa appears fully stacked on the sixth reel and slowly moves leftward with each spin. True to the legend, her gaze freezes your chosen symbols when they land on the reels. In theory, you have a chance to fill the grid before the end of the free spins. You can snag up to 492x bet if you picked the top-paying Siren. Playtech has created an unusually moody theme, darker in tone than previous titles in the series. In the background frame there’s a rocky seashore with crashing waves. The monsters are well drawn and the female ones are fetching. Against a stormy sea, with spooky classical tunes playing, each spin climaxes dramatically with ominous thunderous drumrolls. Also striking is the slow pace of post-spin displays, as each winning payline is tallied. Watching wins mount may not be exactly unpleasant, but it could grow tedious after a while. If so, choose turbo mode. 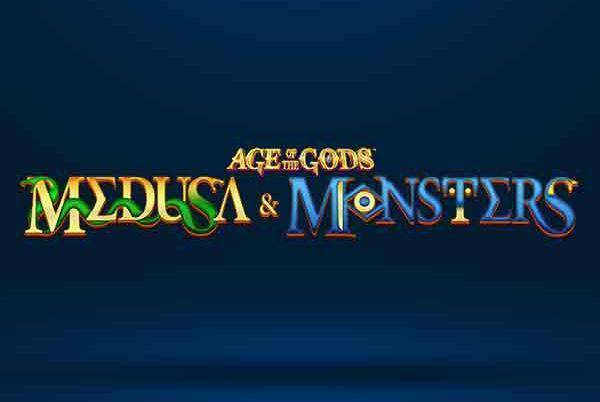 Medusa and Monsters is the eighth title in Playtech’s Age of the Gods series is arguably the most edgy in gameplay and appearance. We applaud the dark and moody setting for these mythical monsters, and it doesn’t really interfere with its solid if somewhat complex mechanics. The Ultimate Power jackpot has been known to reach close to £1,000,000, which seems well worth risking some shivers down your spine and the chance of being petrified or smashed on some sea cliffs. 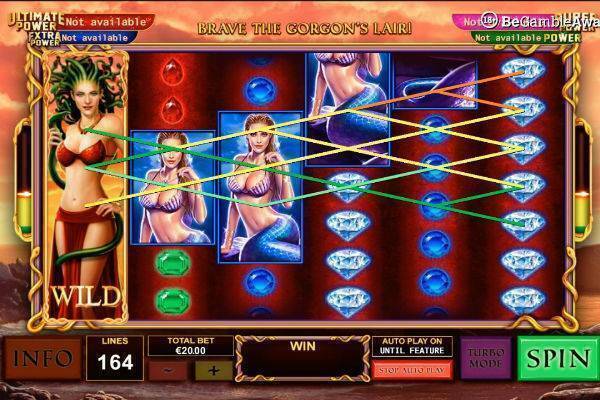 With this slot’s impressive 96.09% RTP, you can let the gorgon and sirens eat their hearts out, not yours.